This 5.1-channel 4K Ultra HD network AV receiver offers built-in Wi-Fi, Bluetooth and AirPlay wireless connectivity, and supports playback of high-resolution audio files. Download the free MusicCast Controller app on your smart device to make accessing your music library and streaming music services easy. Add audio in up to 9 additional rooms with MusicCast wireless speakers or other MusicCast devices. In addition, Dolby Vision and Hybrid Log-Gamma compatibility provide incredible contrast, smooth tone and rich, bright colors. • Stream it all. Listen to Pandora, Spotify, thousands* of free internet radio stations and the music stored on your smart devices and computers. (Note: Deezer and TIDAL available by firmware update, May 2017). • Wireless connectivity. All MusicCast products are fully loaded with Wi-Fi, Bluetooth and AirPlay. • Expand to a whole home audio experience. When you’re ready, add MusicCast wireless speakers, sound bars or other devices in up to 9 other rooms and listen throughout your home. • No wires, easy installation. By using MusicCast, you don't need to fuss with placing wires through walls into other rooms. Play your favourite streaming service. This AV receiver is equipped with Bluetooth functionality to let you enjoy easy wireless music playback from smartphones and other devices. The Compressed Music Enhancer, a digital sound processing technology from Yamaha, is now optimized for Bluetooth audio transmissions to ensure that your music will have vivid, lively sound quality during wireless playback. You can stream music from the RX-V483 to Bluetooth headphones for private listening or to Bluetooth speakers. This AV receiver completely supports with latest HDMI standards. Thanks to transmission of 4K video at 60 frames per second pass-through, you can fully enjoy the high definition video quality of 4K without degradation. It also adheres to the HDCP 2.2 copyright protection standard for 4K video transmission. It also supports HDR (high dynamic range) Video including Dolby Vision and Hybrid Log-Gamma which provides incredible contrast, smooth tone and rich, bright colors. Furthermore it supports the wider color gamut of BT.2020 pass-through. This AV receiver is also compatible with 3D, Audio Return Channel and CEC for easy operation. Create sound fields at home. 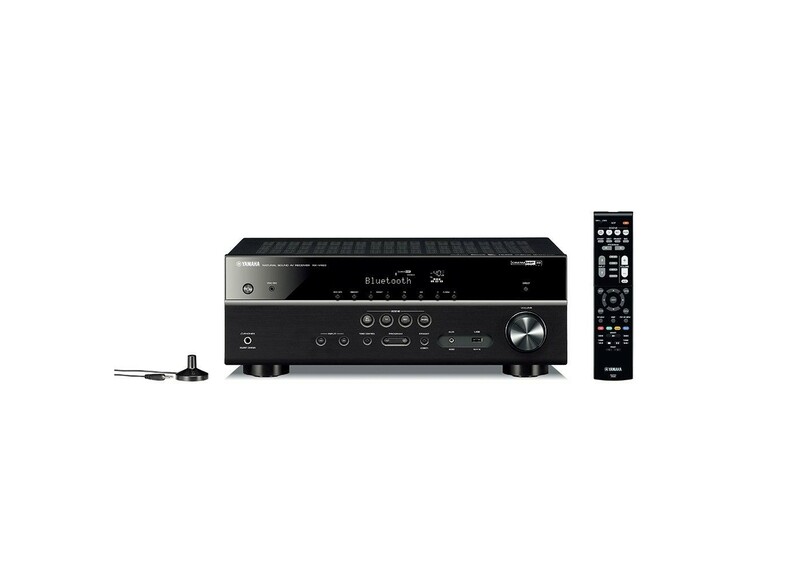 This AV receiver is equipped with a variety of sound programs that utilize original DSP technologies from Yamaha. These sound programs allow you to easily create sound fields like actual movie theaters or concert halls. It is now possible to use the AV Controller app to adjust the DSP parameters of your favourite movie or music. Millions of songs. With the Spotify app on your smartphone, you have instant access to millions of songs. Now you can stream those songs to your networked Yamaha AV receiver by using Spotify Connect. Just hit play to start streaming music. When you listen to Spotify outside on your smartphone or tablet and come inside, the song immediately streams to your Yamaha AV receiver allowing no interruption to your music playback. You can also personalize playlists and receive phone calls while listening to music on Spotify. The Spotify app and premium account are required. Visit www.spotify.com for more details. Try Spotify Premium for free on your Yamaha home entertainment system for 30 days. Visit http://spotify.com/yamaha for more details. Install with ease. The AV Set Up Guide makes it much easier to perform the set up process with the Yamaha AV receiver. This app assists you with cable connections between the AV receiver and source devices. Additionally, it guides you through various settings such as speaker connections, TV and source device connections and power amplifier assignments. System illustrations and actual AV receiver images help you understand how to make the connections between devices. It is available in multiple languages and is designed for iOS and Android tablets. Surround from the front. Even when it is impossible to install surround speakers behind the listening position, you will enjoy virtual 5-channel surround sound with all of the speakers placed in the front of the room. This is ideal for those who can't or prefer not to install speakers in the rear of the room. Surround from the front. Even when it is impossible to install surround speakers behind the listening position, you will enjoy virtual 5-channel surround sound with all of the speakers placed in the front of the room. This is ideal for those who can't or prefer not to install speakers in the rear of the room. Pandora is the effortless and endless source of personalized music enjoyment and discovery. Personalized stations launch instantly with the simple input of a favourite artist, song, or genre, and we take it from there to provide the soundtrack for that moment... anytime, anywhere. Coming soon via a firmware update summer 2017.Deezer connects over 10 million active users around the world to over 43 million tracks. Available in more than 180 countries worldwide, Deezer gives instant access to the most diverse global music streaming catalogue on any device. Deezer is the only music streaming service with Flow, the unique mix of all your old favorites and new recommendations in one ever-changing stream. Based on an intuitive, proprietary algorithm and created by people who love music, it’s the only place to hear all your music back-to-back with fresh discoveries tailored to you. Deezer is available on your favourite device, including smartphone, tablet, PC, laptop, home sound system, connected car or smart TV.